It is a welcome back for Pete who hails from Coventry where he is part of the well known Aardvark Ceilidh Band and you can also find him at many festivals in his other guise selling and repairing all things musical whilst passing on his good advice and knowledge. 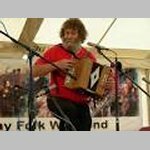 Expect some great melodeon playing along with wonderful collections of songs and tunes. You will have plenty of opportunity to join in.